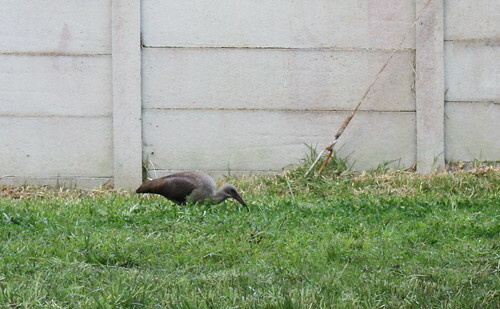 This afternoon I got home to find a Hadeda Ibis in our back yard. Some friends came round to clean up the garden yesterday, and the birds seem to love the shorter grass. I've just installed and set up a new commenting system on our blog. We're now using a commenting system called "Disqus" (pronounced "discuss"), which enables visitors to log in using Facebook, Twitter or Google, rather than having to actually register on the site. As we've previously noted, Zak enjoys listening to music as much as I do. Almost every time we get in the car I turn the music on, and with this Zak expects to hear music. The other day he and I went shopping, and as I pulled off Zak said to me, "Music please Daddy!" Zak, like any other toddler, is learning anatomy as he grows up. We have many notable moments of hilarity when Zak announces certain anatomical and medical "facts" to us. When Zak was sick a little while back, Hannah taught him about how the "white blood cells fight yucky germs" and so he often announces that to anyone who will hear him, including little old ladies in the grocery store. My father-in-law, Howard, is big into fair trade goods. This means that goods are generally bought directly from the farmer, labourer or artisan, at a fair price, before being sold to you. I can understand completely why he likes to support fair trade, and I have decided to see if I can do similar. Unfortunately, I can't always, as money is tight and generally the cheapest option wins for us (especially at the moment). Recently, however, Cadbury's in South Africa had some huge news as far as fair trade is concerned. Their milk chocolate bars (the plain chocolate ones) are certified fair trade, and proudly display the Fair Trade logo on their wrappers. I was even more delighted to see that I could buy them at my local grocery store, and at the same price its always been. How awesome is that?